Two very ripe bananas, leftover crushed pineapple from the Crock Pot Chicken Teriyaki Sandwiches I made last week, and one very large bottle of rum.... These are the ingredients that inspired my newest culinary creation- Pina Colada Banana Bread with a Buttered Rum Glaze. According to my son, I should have deemed this banana bread the Drunken Sailor. ;) But no matter what you choose to call this bread, it is incredibly moist and so flavorful. If you are one to partake in a refreshing pina colada here and there, then you will enjoy this little taste of the tropics as the weather continues to turn colder. The glaze was inspired by a winter favorite though- hot buttered rums. The best of both worlds, right? Preheat your oven to 350 degrees. Spray a bread pan with cooking spray. In a small bowl, whisk together the flour, sugars, baking soda, and salt. Set aside. In a large bowl, whisk together the canola oil, eggs, and coconut extract. Then mix in the bananas, pineapples, sour cream, and rum. Mix the flour mixture into the wet ingredients. Mix well. Then fold in the 1/2 cup of shredded coconut. Pour the bread batter into the prepared pan. The bread will take about 1 hour, 10 minutes to bake. 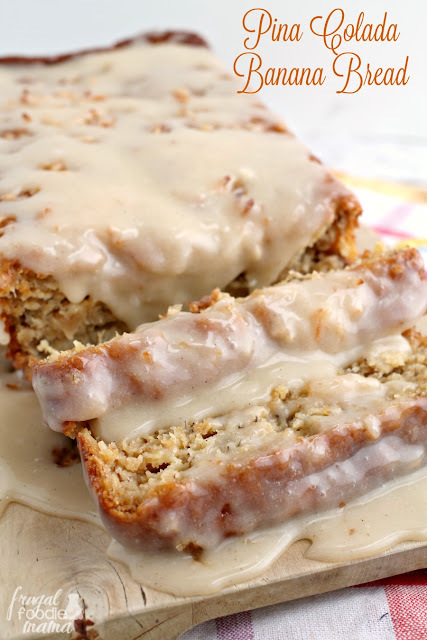 After the first 10 minutes of baking, pull the loaf of banana bread out of the oven and sprinkle the top of the loaf with the remaining 2 tbsp of coconut. Bake for the remaining 60 minutes, or until a toothpick inserted in the middle comes out clean. Allow the bread to cool in the pan for about 10 minutes and then turn out onto a wire rack. 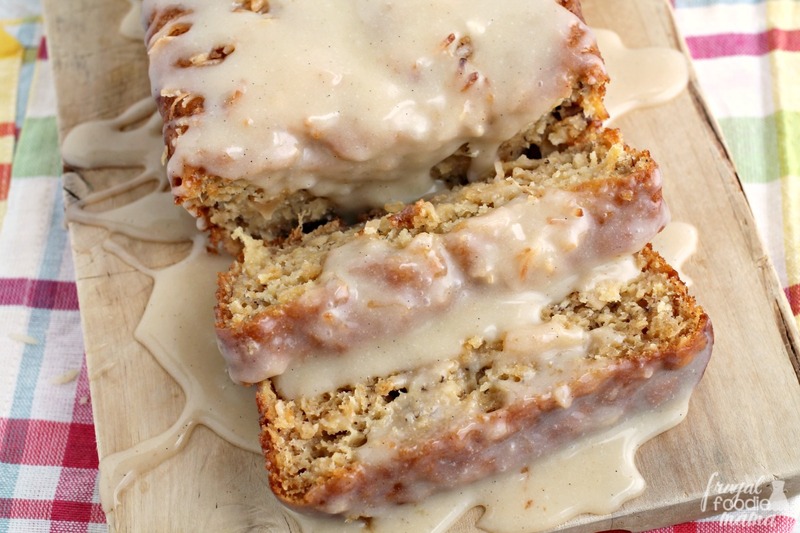 While the banana bread is cooling, prepare the Buttered Rum Glaze. In a small saucepan, heat the butter until melted. Add the rum and the vanilla. Cook over medium heat for about 3-5 minutes. Remove the buttered rum from the heat and pour into a smaller bowl. Allow to cool for 15-20 minutes. Once cooled, whisk in the powdered sugar until smooth. Pour the glaze all over the top of the cooled Pina Colada Banana Bread. OMG. This is ooey gooey yummy goodness! The icing looks fantastic! I made a pina colada cake last week. This looks great and right up my alley. Found your blog on the GYB hop party. Oh my goodness, I just want to scoop up the buttered rum glaze with my finger! Yummy!! This sounds amazing with that buttered rum glaze! Looks gorgeous and sounds delicious! I love the cake and the glaze. 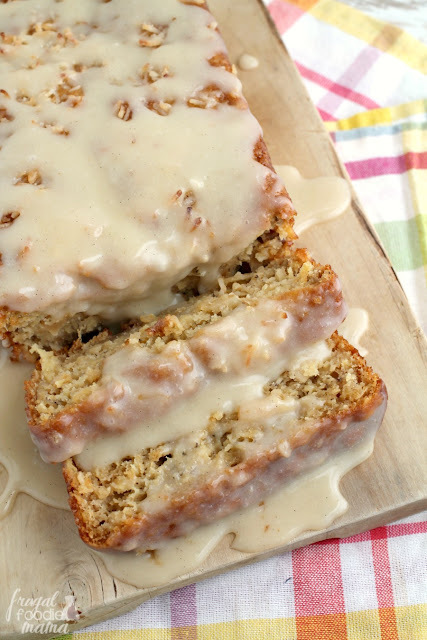 Oh that looks delicious, I happen to have a few bananas in the freezer waiting to be made into bread! Oh, thank you so much everyone!! 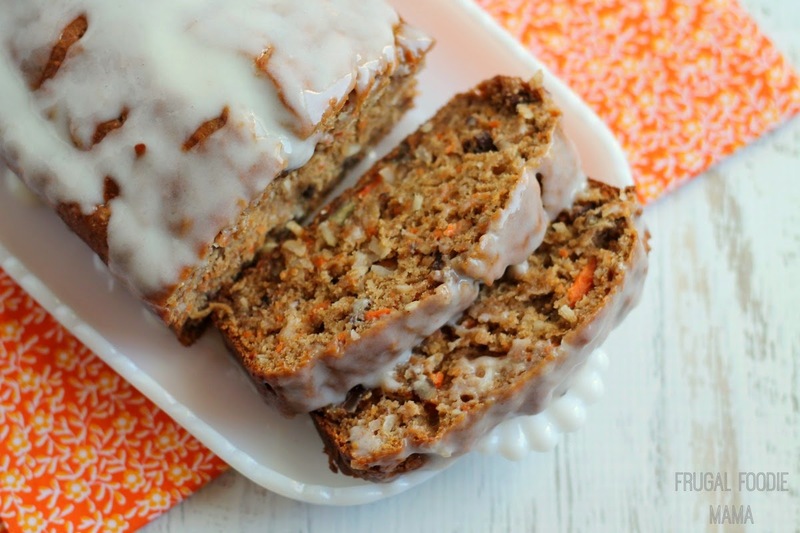 :) This is by far the BEST banana bread I have ever made- no joke! i know this has got to be wonderful, BUT, i need a non-alcholic version. so if i used rum extrect instead, how much do you think i would need? also would i need an additional amount of some liquid to help to replace the rum? I just made just had a slice with it was still warm.........I think I just went to Heaven. Oh my, it was so good I did lick up the run off glaze with my finger! I did make a few adjustment to your recipe...spendid and light brown sugar. I had made a cheesecake just before and I thought I had save somw sour cream but I d use it so I borrow from my neighbor Greek yoguert with pineapple. The bread is very light and moist. I did not use all of the glaze because of my husband is diabetic. I promised I would go like so he at least have a bite. I am having dinner guest Friday and ar egiving them a choice of my sugar free lemon cheesecake or your bread with coffee. I bet both! Thank you for sharing this creation with us! Awwwwww... thank you so much for all the kind words! 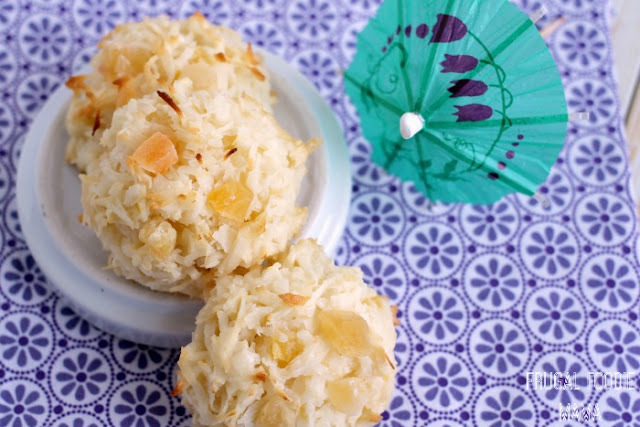 :) Oh, and I love the idea of using pineapple Greek yogurt. I am actually delving into using Greek yogurt more in my recipes. I pretty much find sour cream and yogurt interchangeable when it comes to baking. :) I hope your dinner guests love the bread as much as you do!